LOS ANGELES, California (CNN) -- Jewish students and faculty at California universities fear for their safety on campus because of threats aimed at them over the Middle East conflict, the father of a slain Wall Street Journal reporter said Friday. Judea Pearl, the father of slain reporter Daniel Pearl, says anti-Semitism is on rise on college campuses. Judea Pearl, whose son, Daniel Pearl, was kidnapped and killed by al Qaeda extremists while on assignment in Pakistan in 2002, told reporters at a news conference that anti-Semitic e-mail and verbal threats have escalated since Israel's three-week invasion of Gaza in January. Pearl teaches computer science on UCLA's Westwood campus. On the school's Web site, UCLA Chancellor Gene Block issued a statement about the university's policy. "The conflict in the Middle East and current events in Gaza are some of the most highly controversial issues of our time, stirring deep emotions on all sides," the statement read. "We have a responsibility to protect the freedom of expression. We also all have a responsibility to listen and engage -- respectfully -- even as we must understand that not every campus forum on a controversial topic will satisfy passionate and concerned members of the campus and broader communities," said Block. Pearl and officials at the Simon Wiesenthal Center, where the news conference was held, are concerned that administrators on college campuses across the country are not doing enough to foster freedom of expression while protecting Jewish students and faculty members from acts of intimidation on campuses. "The verbal abuse is there, the intimidation is there, the feeling of helplessness is there, not only among students but among faculty," said Pearl. Pearl cited an incident several years ago in which he was threatened. "I received hate messages from someone at UCLA who did not identify himself and said, 'I saw you in Ackerman Union and I know where your office is and I'm going to beat the (expletive) out of you,'" Pearl said. "I handed it to the campus police, and they did not do anything." UCLA spokeswoman Elizabeth Boatright-Simon told CNN there is no record of Pearl's complaint to campus police but said the university plans to meet with him. Wiesenthal Center officials cited another incident three weeks ago at San Jose State University where the consul general of Israel was verbally abused and forcibly driven from the stage during a guest-speaking engagement aimed at fostering understanding of Jewish culture. 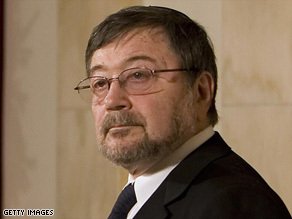 The diplomat, Akiva Tor, had to be escorted out of the room by security officers and campus police before the event ended, according to Rabbi Abraham Cooper of the Wiesenthal Center and Michelle Salinsky, president of Spartans for Israel, the group which co-sponsored the speaking event. "We were extremely concerned about our safety and Mr. Tor's safety," said Salinsky, a senior majoring in political science. "Mr. Tor said he's never felt more disrespected. This was clearly an infringement of our expression of free speech. I think a lot of Jewish students do not feel safe on campuses because of the escalation of hate perpetrated against Jews." San Jose State University spokeswoman Pat Harris told CNN the sponsors of the event were responsible for moderating the speaking forum but maintained that officers and security personnel acted appropriately. In a statement, the university president Jon Whitmore defended the university's policies but expressed concern about the event. "Our campus places high value on the free exchange of ideas in a manner that is inclusive and respectful of differing views," the statement read. "At a recent campus event, numerous members of the audience with views differing from the invited speaker were so vocal in their expression of opposition and so uncooperative with the moderator's requests for orderly means of handling questions and answers that they disrupted the event and did not allow the speaker to respond to posed questions. The university fully endorses the free expression of ideas and opinion, but does not condone behavior and methods of expression that disrupt free and orderly discussion." As part of an effort to promote tolerance, the Wiesenthal Center announced plans to unveil a public service campaign next month which will be distributed online at Columbia University, UCLA, UC-Berkeley, San Jose State University and the University of Chicago, among other campuses. "There are a lot of Jewish kids in California and elsewhere who are beginning to look elsewhere and saying maybe the UC system is not a user friendly place to go and we can't accept that," said Cooper.